We see every challenge as an opportunity, and this initiative helps us ensure that our partners are better prepared to manage the unique situations they find themselves in. We are invested in an innovative approach that empowers our community and delivers the support they need, when they need it. We love to share our passion to help promote awareness of the Caribbean Culture! Here at Arizona Afro Caribbean Festival, we are driven by a single goal; to do our part in making the Afro Caribbean Carnival Multicultural Festival of The Arts a place for all. Our decision making process is informed by comprehensive studies and high quality data evaluation. We strive to build productive cultural relationships that make a positive impact with all of our pursuits. 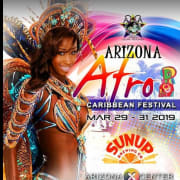 Arizona Afro Caribbean Festival was created by like minded individuals who saw the need to increase our cultural platform on a wider scope to include everyone. We saw the need for Art, Costume, Dance, Drama, Voice and Music that uses folklore dances and instruments as the focal point in determination, persistence and love of creativity and accomplishment. We are One Voice, One People in Unity making a footprint to insure our cultural heritage and legacy is embedded in the history of the State of Arizona! Would you recommend ARIZONA CARIBBEAN CULTURAL ASSOCIATION?